Duke Nukem 3D is a first-person shooter that was originally released on MS-DOS in 1996. Your job is to kill aliens and foil their plans to destroy Earth. There's three episodes and the objective in each level is to collect key cards to unlock doors and reach the exit. At your disposal is an extensive range of weapons, as well as a robust inventory system. The frame-rate is low but it's better than the PSX version and the slower gameplay helps to minimise over-steer when aiming. It's also easier to cycle through weapons as this port doesn't require button combinations. The L.A. Meltdown episode gets things off to a good start with memorable battles in an adult cinema and Death Row. Although some areas have been simplified it actually cuts out a lot of the fluff. However, The Abyss canyon level is a confusing mess due to the lack of signposting and awful precision platforming. The Lunar Apocalypse episode fares better and the futuristic theme reminds me of Perfect Dark (2000, N64). Finally, Shrapnel City is perhaps the best episode in the game, taking in varied locations such as a Bank, Movie Set, Subway and Hotel; unfortunately it includes another canyon level. The Plug 'N' Pray episode from the PSX version is absent but it's no great loss in my opinion! The game is at its best when it sticks to straight-up shooting and exploring; where it falters is when it throws in gimmicky abilities such as the fiddly Jet Pack and Scuba Gear. There's lots of trial and error too and no Quick Save option to ease the challenge. The unlockable 2D Death Tank Zwei mode is a fun real-time tank battle between 2-7 players using trajectory shots. Its simplicity is addictive and it could almost be a standalone game! 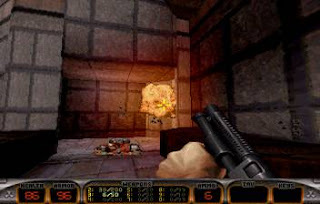 Duke Nukem 3D is a good first-person shooter with oodles of personality, terrific level design and less technical issues than the PSX version. It does have some issues (e.g. its awkward inventory items and canyon level miscues), but there's lots to love and the game's expansive content / hidden modes will keep you occupied for a while. Random trivia: Despite missing the fourth episode, this port does have an exclusive secret level called Urea 51.